The guys at BuildLounge wrote us to share a giant LED sign they came across in the submission pile for their “Win a Laser Cutter” contest that’s currently under way. [Stephen Shaffer] helps run a huge party called Fantastic Planet, for which the group typically outsources the lighting arrangements. They got tired of hiring light guys several times a year and built their own mega display for the festivities instead. 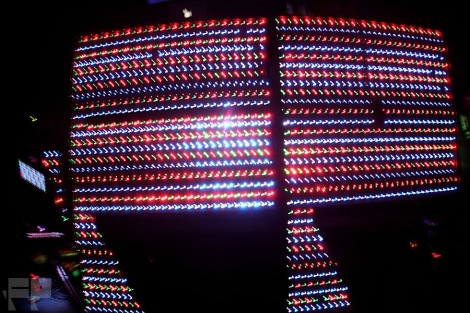 The LED sign consists of 1,474 LEDs that output well over 10,000 lumens. The sign was produced for just about $800, which is very reasonable for a display of its size. The whole thing is controlled by a pair of Arduinos paired with 34 MIC5891 shift registers, all mounted on custom designed PCBs that the group produced in-house. The display looks great, but don’t take our word for it – check out the video below to see it in action. If you are interested in taking a closer look at how it was built, swing by the build thread to see more details. It initially only cost $500, and even then most of the cost was in wire, wood, solder, soldering irons and those 36 micrel MIC5891 ICs. However the design should never have allowed the MIC5891s to be so far from the clock and data source. The long clk and data distances caused tons of EMI to be induced, and I was forced to do a slow fix of RS 485 twisted pair. this required 34 receivers and two transceivers at each arduino. If I had to do it again, I wouldn’t even use shift registers. I would instead use 34 mini arduino PCB nodes, since after the RS 485 network was done, it essentially cost more than 34 atmega328Ps would’ve. Also a large factor to this entire project is that it was built in only one month during time off from school. A Huge factor, the sign wasn’t even programmed until the night before the show! Cool. I wasn’t thinking of tooling. I don’t usually include that when I calculate a project. Did you ever consider 74 series shift registers and transistor gangs? I surprised you had to go 485. Are you just using shielded pair of full 24v 485? That stuff is pricey. There are some easy ways to kill noise such as cable drains, ground planes and bonding them, power/data cable segregation, and enclosure partitioning. I have to live with all that in industrial environments near 480v VFD’s. Talk about noisy if they’re not installed correctly. It looks good. I hope this doesn’t come off as negative. We tried to kill noise, but the main noise component was caused by transmission line effects, which normally in long lines can be controlled with proper termination and grounding etc, but with 34 nodes, the transmission effects were unique per each strand of wire from one chip to the next, I tried RC filters, higher voltage data and clock lines, and a few other things. interference was minimized, but the clock line kept bouncing randomly in the Mhz range. This causes data errors in the serial feed. It was actually easier for me to use the RS485 to introduce +/-5v differential data, more like rs232, however the distances were too long in some area to use rs232, so 485 was chosen. Yes it was expensive. If I had to do it again, I would not make nodes, it is easier make it all on one board, and use more wire, and deal with inductance issues in long power lines. I also really wanted to use RGB leds, but man would that be even more expensive! Very well done, hats off. Pricey though, but it’s quality looks very consistent. The lack of flicker due to the frame update method is very nice. I agree, nice job, I wish we could’ve afforded to make our sign as nice! I want to rave with these guys! That’s a very strange shape for an LED panel. It should be mentioned, I had strict insturctions to cut this thing out proportionallly to our FP logo designed by my brother, I sure hated working in the corner of the F! But it worked wonderfully, at first people were like “Cool logo prop!” Then hours into the party, we turned it on, everyone was dazzled!